This past week, I did a three day internship at restaurant De Kas. 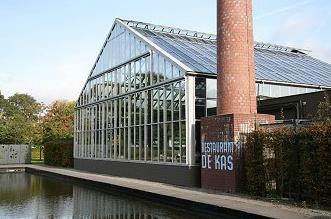 De Kas is a restaurant in Amsterdam, with their own greenhouse (kas) and land. The restaurant has a set menu which changes each week and is based on the fresh produce available at that moment. A specialty of De Kas is that the chefs like to use flowers in their dishes (like nastratium -oostindische kers, begiona, marigolds – afrikaantjes and dahlias). It’s amazing to see which flowers you can eat… and they add color to a plate. A really simple salad, becomes a little piece of art. I did not realise this before, but restaurant De Kas can handle over 200 couverts… So volumes are enormous. To give you an idea, I prepared over 200 tarte tartins one day (single tarte tartins based on half an apple with dough) and I made brownie dough for a few hundred brownies. It’s actually kind of cool to make such large quantities. I was particularly interested in finding out how a large restaurant manages it’s logistics. How do they make sure that their customers receive the food they ordered relatively quickly, even though approximately 20 people order at the same time. Not surprisingly it’s all in the mis en place. During the day, all the basis ingredients are carefully prepared, an hour before service the plates are pre-prepared and then during the service the plates can be finished off very quickly. I found it really impressive to watch the kitchen run smoothly for this restaurant with on Tuesday 160 and on Wednesday 195 customers seated for dinner…. And… very important, I did manage not to cut or burn myself during these three days. Quite an achievement for me! During the service I was allowed to help assemble the plates, which had to be done at a very quick pace and that was really cool to help with. I kind of like working at a fast pace like that. But after a working day from 10am to 10 or 11pm, standing almost the entire day, my back was broken… I respect people who do this work on a daily basis, it’s such hard work! For me it was fun to be allowed to join the team for a few days. I would not want to work in a large kitchen like this, especially not on a full time basis, but it’s impressive to watch and to get a bit of an understanding of the enormous organisation which is required to run a restaurant this size.